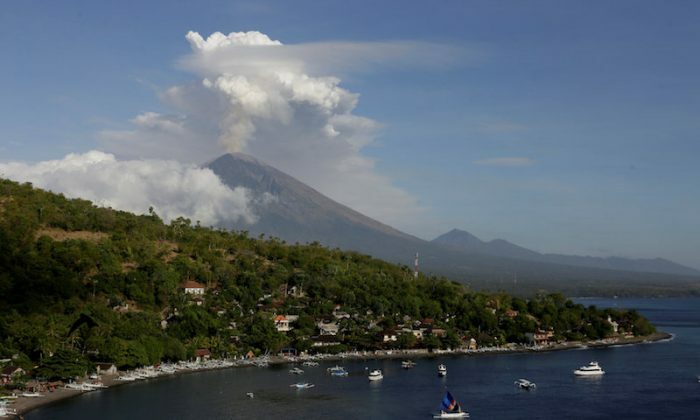 DENPASAR, Indonesia—The airport on Indonesia’s holiday island of Bali reopened on Friday after ash from a volcano forced a brief closure and the cancellation of more than 300 flights. Mount Agung in northeastern Bali has been rumbling to life intermittently since late last year and it began belching smoke and ash again on Thursday. It was shooting a column of ash more than 2,500 meters (8,200 feet) into the sky on Friday and officials said operations at Indonesia’s second-busiest airport would be reviewed every few hours. Earlier, authorities were forced to cancel 115 international flights and 203 domestic ones, affecting nearly 27,000 travelers. “We’re monitoring the eruption,” said Israwadi, a spokesman for airport operator Angkasa Pura. Airlines avoid flying through volcanic ash as it can damage aircraft engines, clog fuel and cooling systems and hamper visibility. Agung towers over eastern Bali to a height of just over 3,000 meters (9,800 feet). Its last major eruption in 1963 killed more than 1,000 people and razed several villages. Sutopo Purwo Nugroho of the disaster mitigation agency said activity was going on deep under the volcano. “Micro tremors are still being detected … indicating that magma is moving towards the surface,” Nugroho said in a statement. Operations at Bali’s airport were disrupted for more than week in early December, stranding thousands of visitors before winds changed to blow the smoke away and the volcano calmed down. Hundreds of villagers living near the volcano evacuated their homes as it began erupting on Thursday, and moved into three evacuation centers. Anxious passengers thronged Bali’s airport, waiting for news about their flights. Among the airlines serving the resort island, Garuda Indonesia, Sriwijaya and Indonesia Air Asia said they were working to help stranded passengers. Virgin Australia, Qantas and Jet Star were monitoring the situation in consultation with Australia’s Bureau of Meteorology’s Volcanic Ash Advisory Centre.